The International Federation of Robotics (IFR) recently released their annual statistical recap and four-year forecast for the robotics industry. The IFR produces two research books: one that covers industrial robots and the other for service robots. The two IFR books can be purchased and downloaded in PDF form for $728.00 by linking here. In 2013, 178,132 industrial robots were sold for $9.507 billion. That is an increase of 11.9% over 2012 results. These figures reflect the actual data provided by country-specific robotic associations but the IFR estimates that the true market is double that, i.e., $29.578 billion for 2013. The IFR forecast for 2014 is that 200,000 robots will be sold, 15% more than 2013; between 2015 and 2017, growth will likely continue at about 12% annually. Year over year growth was particularly noticeable in China which grew 59.6% and South Korea, 35.4%. Japan had an off year (down -20.7%) probably due to the Fukushima disaster and loss of substantial power and resources country-wide. UPDATE 10-27-14: The Robotic Industries Association, (RIA), a non-profit trade association for the North American manufacturing and service robotics industry, reported that through the 3rd quarter of 2014 sales are up 35% in units and 22% in dollars over the same period in 2013. Professional: $3.567 billion down from $3.635 in 2012 while unit sales were up from 20,214 in 2012 to 21,036 in 2013. Logistics systems were up 37% for the year; construction and demolition systems were up 30% and defense was down -2%. Personal/Domestic: $1.715 billion up from $1.225 in 2012. Unit sales were also up 28% from 3,044,596 to 3,911,576. Projections for the period 2014-2017 indicate a compounded annual growth rate of 19%. The number of units sold and deployed can sometimes be misleading when considering future trends. 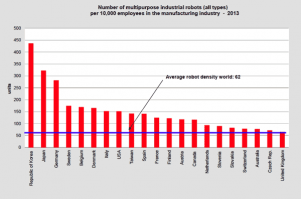 Thus the IFR has coined a more preferable measure to compare robotics country by country: robot density. Robot density is the number of industrial robots per 10,000 persons employed in the manufacturing or automotive industries. Thus the big 3 – those with the highest density ratios and considered to be the most automated – are South Korea, Japan and Germany with scores of 437, 323 and 282 respectively. For comparison purposes, the US is 152, Canada is 116 and China is 30. Low numbers indicate the potential for future robot installations as countries automate to stay competitive. 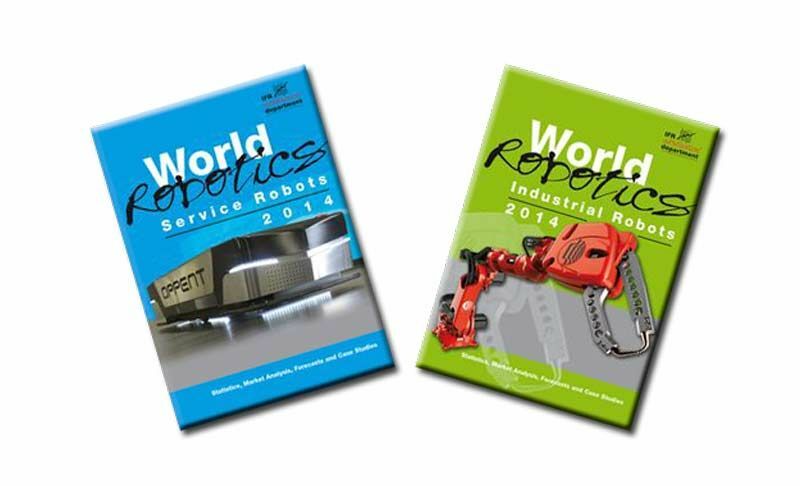 NOTE: All figures and charts shown are from the IFR World Robotics Industrial Robots and Service Robots 2014 books.